We used human papillomaviruses (HPV) as a model system to evaluate the utility of a nucleic acid, hybridization-based bioelectronic DNA detection platform (eSensor™) in identifying multiple pathogens. Two chips were spotted with capture probes consisting of DNA oligonucleotide sequences specific for HPV types. Electrically conductive signal probes were synthesized to be complementary to a distinct region of the amplified HPV target DNA. A portion of the HPV L1 region that was amplified by using consensus primers served as target DNA. The amplified target was mixed with a cocktail of signal probes and added to a cartridge containing a DNA chip to allow for hybridization with complementary capture probes. Two bioelectric chips were designed and successfully detected 86% of the HPV types contained in clinical samples. This model system demonstrates the potential of the eSensor platform for rapid and integrated detection of multiple pathogens. Global emergence of pathogenic infectious diseases by both natural and intentional means presents a formidable challenge to infectious disease surveillance and response, namely timely and efficient pathogen detection. Many laboratory methods exist for identifying pathogens, but most require exquisite care in sample handling and processing prior to characterization of a pathogen. In addition, costly and perishable reagents, equipment, and supplies are required for sensitive and specific detection. The ideal detection system would integrate sample processing and pathogen characterization into a single automated device that would eliminate laborious, and time consuming sample processing and costly detection. Bioelectronic detection of nucleic acids on a miniature solid support is one of the first steps toward development of such an integrated detection device. Bioelectronic DNA detection involves forming an electronic circuit mediated by nucleic acid hybridization and it serves as the basis for a DNA detection system called eSensor™ [1–4]. This system uses low-density DNA chips containing electrodes coated with DNA capture probes. 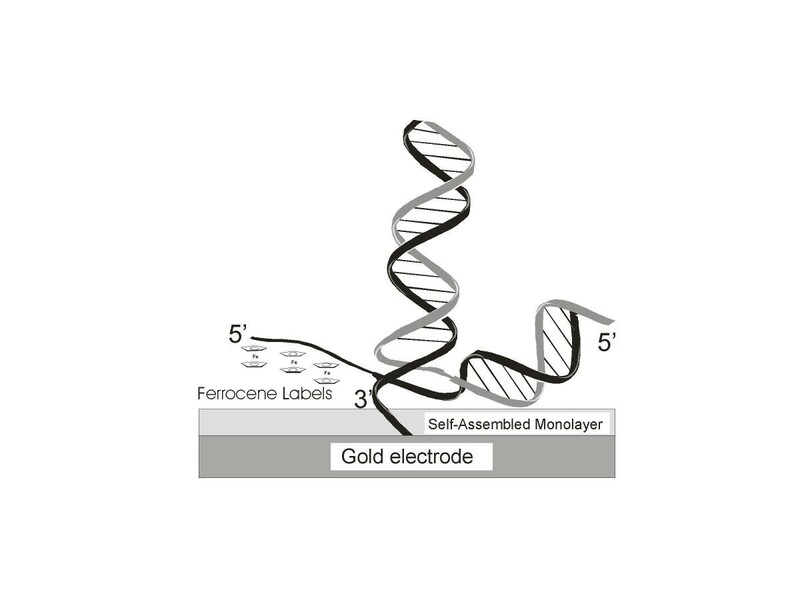 Target DNA present in the sample hybridizes specifically both to capture probes and ferrocene labeled signal probes in solution thereby generating an electric current. Current eSensor DNA chips contain as many as 36 electrodes for simultaneous detection of multiple pathogens from a single sample. Many pathogens cause both acute and chronic disease at relatively low copy number and may be difficult or impossible to propagate in culture. Thus, most pathogen detection systems rely on nucleic acid amplification by using polymerase chain reaction (PCR). One highly effective amplification strategy targets conserved sequences among the family of organisms of interest. Such broad-range PCR strategies have been used to identify and characterize several known and previously uncharacterized bacteria [5, 6] and viruses [7, 8]. In order to maximize the utility of these effective pathogen nucleic acid amplification systems, amplification needs to be coupled with rapid, sensitive, and specific detection. Bioelectronic DNA detection by use of the eSensor chip might fulfill this need. Human papillomaviruses (HPV) serve as an ideal model system for determining the efficiency and feasibility of eSensor DNA detection technology since there are at least 30 distinct genital HPV types that can be effectively amplified with broad-range consensus PCR primers . We designed two eSensor chips, each containing 14 probes specific for the conserved L1 region of the HPV genome. We evaluated clinical cervical cytology samples known to contain one or more HPV types. The eSensor DNA detection platform successfully detected the correct HPV type in most of these clinical samples, demonstrating that the system provides a rapid, sensitive, specific, and economical approach for multiple-pathogen detection and identification from a single sample. We used previously described printed circuit board technology to manufacture eSensor chips with 16 gold electrodes, one reference electrode, and one auxiliary electrode [2–4]. Each electrode was wired to a connector at the edge of the chip. Capture probes were synthesized using an alkane chain of 16 residues terminated at the 3'-end with a disulfide which was spotted onto the gold electrode on the chips to form a self-assembled monolayer . The chips were glued into a plastic housing with a port for sample introduction. Hybsimulator (RNAture, Inc., Irvine, CA) was used to design the HPV target mimics, and signal and capture probes. For these experiments, we designed capture (Table 1) and signal (Table 2) probes to hybridize specifically to the exon sequence of β-globin and to HPV sequences within the 450-bp L1 region amplified by the PGMY primer set. Signal probes (Table 2) tagged with eight ferrocenes were synthesized with a modified adenine residue (N6) containing a ferrocene substitution on the ribose ring . No signal probes were synthesized for HPV types 33, 39, 55, and 73. HPV target mimic oligonucleotides were synthesized for types 6, 11, 16, 18, 26, 31, 35, 40, 42, 45, 51, 52, 54, 56, 58, 59, 66, 68, 82, 83, and 84 (Table 3). Human papillomavirus (HPV) capture probe and PCR primers sequences. HPV type and signal probe sequence. Residual ThinPrep (Cytyc Corporation, Boxborough, MA) cervical samples previously tested for HPV using the Roche line blot assay  were used in this study. Twenty samples containing 24 of the 27 HPV types on the reverse line blot were selected for extraction and testing. (No samples were positive for HPV 53, 55, and 57.) Therefore a total of 21 HPV types could be evaluated (there were 22 HPV capture and signal probes minus no clinical sample containing HPV 53 leaves 21 possible HPV type answers). Samples were coded so that investigators were blinded to the presence of multiple HPV types. DNA was extracted from 250 μL aliquots by using the QIAmp DNA Mini Kit (QIAGEN Inc., Valencia, CA). The procedure provided with the kit was followed except that the proteinase K digestion was done overnight at 56°C. Following DNA elution from the column, DNA was concentrated in a Centricon Centrifugal Filter Device YM-100 (Millipore Corporation, Bedford MA) according to manufacturer's specifications. Each DNA sample was brought to 50 μL with the addition of ultra pure water. Five microliters of purified DNA from cytology samples was used in each PCR assay. HPV DNA was amplified with the PGMY09/PGMY11 primer system that uses a multiplex format to amplify both HPV and β-globin in the same tube . To allow for strand separation, only the downstream primers designated PGMY11 and one β-globin primer were biotinylated (Table 1). The use of one biotinylated primer to amplify the product was still sufficient to verify the amplified HPV type by reverse line blot. Amplification without DNA template was used to monitor contamination. Avidin-coated beads were used to harvest the biotin-labeled DNA strand from 50 μl of product. The biotin-free DNA strand was then used in the assay. Briefly, the target mimic or target DNA was mixed with a signal probe cocktail (125 nM of each signal probe) in a hybridization buffer (proprietary). This mixture was injected into the eSensor chip for hybridization at 40°C for 2 to 8 hours. The chips were then scanned by an AC voltammetry technique built into the eSensor detection device called the eSensor 4800, from -50 to +550 millivolts, to detect and interpret the electrochemical signal generated during hybridization. Investigators recording eSensor results remained blinded to prior or current HPV results. Forty microliters of the amplified products was also independently tested for HPV using a reverse line probe assay (typing strip and reagents generously provided by Janet Kornegay, Roche Molecular Systems, Inc., Alameda, CA). In each case the HPV results on the strip were concordant with prior results. HPV detection and typing results from eSensor and Roche were then directly compared. The electrochemical signal is generated when the HPV amplicon hybridizes to the capture probe and ferrocene-labeled signal probe, thereby bringing the reporter molecule, ferrocene, into contact with the self-assembled monolayer on the gold electrode (Fig. 1). An alternating current voltammogram is obtained when HPV is detected in a sample but no electronic signal is registered when HPV DNA is absent from the sample. (Fig. 2). Schematic represention of the eSensor DNA Detection System. A self-assembled monolayer is generated on a gold electrode. For electrochemical detection to occur across the monolayer, two hybridization events must occur: the first between the capture probe (shown in black perpendicular to the electrode) and the target (for example, HPV DNA, shown in gray), and the second between an adjacent region of the target and ferrocene labeled signal probe (shown in black parallel to the monolayer). The eSensor™ bioelectronic representative signal output. 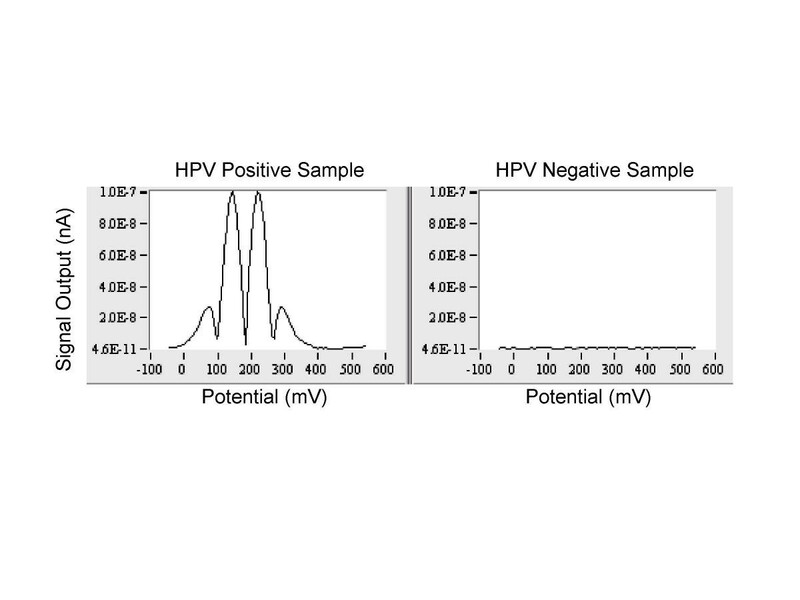 A fourth harmonic alternating current voltammogram is obtained from an HPV-positive sample (left panel), and one obtained from an HPV-negative sample (right panel). The faradic signal in the fourth harmonic closely fits the third derivative of a Gaussian curve. The peak current (100 nA) in the fourth harmonic voltammogram is determined by averaging the two peaks that center around 130 mV. Many of the HPV target mimics tested resulted in a specific signal, with the exception of HPV types 16, 26, 35, 40, 42, 51, 52, and 82. This nonspecific hybridization signal generally resulted from a long stretch of complementary sequences (6–8 bases) among the HPV types due to their close genetic relatedness. Nonspecific hybridization was eliminated by introducing a mismatched base to the complementary region in the signal probes for HPV types 16, 26, 35, 42, and 82 and the capture probes for HPV types 40, 42, 51, 52, and 82. For instance, the HPV 16 signal probe hybridized with both the HPV 16 target mimic (Fig. 3, left panel) and the HPV 52 capture probe (Fig. 3, center panel). This cross-reactivity was eliminated by changing the second A base in the 5'-end of signal probe to a G base (Fig. 3, right panel). In addition, we demonstrated that one base modification of the signal probe (Fig. 3, left and right panels) generated minimal negative impact to the assay signal level. Applying this strategy, we were able to effectively reduce the cross-reactivity among the signal and capture probes for those HPV types where problems of non-specific signal had initially been encountered without compromising hybridization strengths. HPV 16 Signaling Probe Optimization. The HPV eSensor™ chip was decorated with 11 different HPV capture probes and an HIV capture probe as a negative control (shown in x-axis). An HPV 16 target mimic was detected by the eSensor in the presence of HPV 16 specific signaling probe (left panel) in which the sample also reacted with HPV 52-specific capture probe. The signal was identified as being from the hybridization between HPV 16 signal probe and the HPV 52 capture probe as shown in the mid-panel in which HPV 16 signal probe was introduced into the chip without any target mimic. The HPV 16 signal probe was modified replacing the second A base in the 5'-end with a G base. The resulted new signal probe hybridized specifically with the HPV 16 target mimic and did not cross-react with the HPV 52 capture probe. In most instances for the 20 samples tested, there was perfect concordance between the HPV type(s) detected by reverse line blot and the eSensor system (Table 4). The eSensor detected 18 (86%) of 21 HPV types. In samples with multiple HPV types amplified by the consensus primer system and typed by reverse line blot (but blinded to the individual conducting the eSensor assay), the eSensor successfully detected the multiple HPV targets in all six samples (Table 4). We have presented a model application of a novel electronic detection platform [1–4]. We used HPV as a model infectious disease system because consensus primers are available that amplify at least 30 closely related genital HPV types. The resulting amplicons are extremely similar, and this relatedness challenges the ability of the eSensor technology to distinguish accurately among these pathogens. The first optimization steps involved evaluation of electrochemical signal generation by using HPV target mimics. Cross-hybridization was observed between a subset of HPV target mimics and the capture and signal probes. This cross-hybridization was easily overcome by the introduction of mismatched base pairs. The effectiveness of single-base mismatch discrimination of the eSensor has been demonstrated by using wild type and mutant strains of human immunodeficiency virus . We used the eSensor DNA chip to determine the presence of single or multiple HPV types in cervical cytology samples. While the presence of the target HPV type was known, the presence of other HPV types in the same sample remained blinded (e.g., the HPV 42 in a clinical sample was identified but the presence of HPV 68 in the same sample was not known to those performing electrochemical detection). There was good concordance for the detection of the target HPV type by the eSensor DNA Detection System. Eighteen (86%) of 21 target HPV types represented on the chip were readily detected by the eSensor (Table 4); HPV 40, 45 and 54 were not detected. Some of the other discrepancies could be due to lack of rigorous optimization of sensitivity parameters for the eSensor system, such as the weak HPV 54 result on reverse line blot and lack of detection on eSensor. Low-level signals on the line probe assay have been validated by sequencing the amplified product . For HPV 40 discrepancy, the capture probe design may not have been optimal to allow for hybridization with the HPV 40 target. These HPV types may be variant types that did not hybridize to the capture probe and subsequently could not be detected by the signal probe. Not only are there over 200 HPV types, but several sequence variants of HPV types are known to exist . Most hybridization reactions could be analyzed after 2 hours, although in several instances up to 8 hours of hybridization time was required. 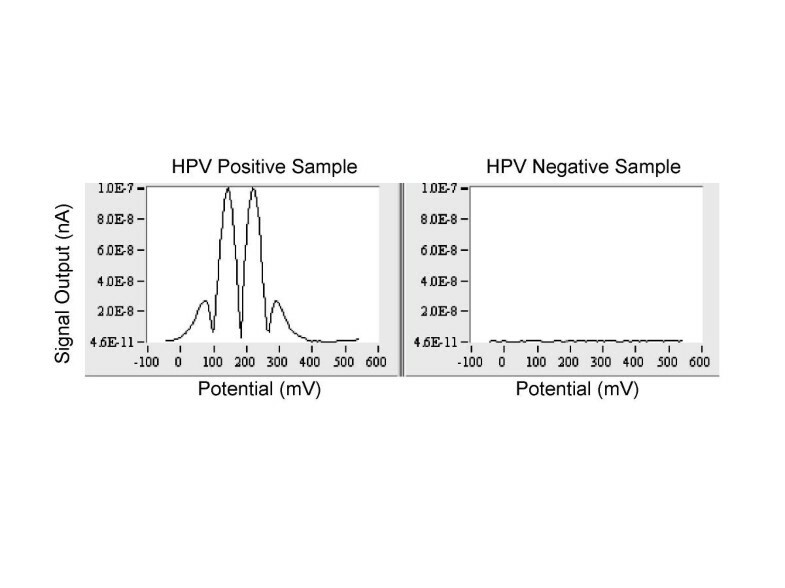 The intent of this study was to use HPV as a model system to assess the feasibility of electrochemical detection with the eSensor chip of multiple pathogens, not to achieve perfect concordance of HPV detection with the reverse line blot. In this model assay, we have performed optimization of probe sequences and assay protocol by using synthesized target mimics. The resultant assay correctly identified nearly all HPV type in the clinical samples. No attempt to further optimize the assay using PCR amplicons, rather than target mimics, was made and neither was the PCR process optimized for detection by using the eSensor DNA detection system. This work demonstrates the ease with which a multi-analyte panel assay can be prototyped using the eSensor DNA detection system. For clinical applications, the prototype assay can be readily fine-tuned by optimizing the conditions for PCR and hybridization to yield concordance levels approaching 100% (data not published). The bioelectronic detection platform described here includes disposable DNA chips and laboratory-based electronic readers and is a first-generation system that ultimately will facilitate the development of relatively low cost, arrayed nucleic acid-based tests. For widespread clinical laboratory adoption, these arrays must have clinically appropriate densities compatible with the needs of molecular diagnostics laboratories, (i.e., low cost and not labor-intensive). The system described could also be developed as a foundation for devices to be used for point-of-care testing for other infectious diseases. Use of trade names is for identification only and does not imply endorsement by the Public Health Service or the U.S. Department of Health and Human Services. This research was supported in part by Memorandum of Understanding between the Viral Exanthems and Herpesvirus Branch in the Division of Viral and Rickettsial Diseases, National Center for Infectious Diseases, Centers for Disease Control and Prevention and Clinical Microsensors, A Division of Motorola and by the National Cancer Institute's Early Detection Research Network (EDRN), Interagency Agreement Y1-CN-0101-01. Authors SDV, ERU, DLM, and WCR declare no competing interests. Authors DHF, VC, YPC and GFB are employees or are currently employed at Motorola Life Sciences whose technology this work was based. Both DHF and GFB own or previously held Motorola Stock. Author 1 (SDV) contributed to the conception and design of this study, the analysis of the results and drafted the manuscript. Author 2 (DHF) contributed to the design of the experimental approach using the bioelectric chip, implemented the experimental approach, and assisted in drafting the manuscript. Author 3 (ERU) contributed to the conception and design of this study, the analysis of the results and drafted the manuscript. Author 4 (VC) conducted the laboratory work at Clinical Microsensors. Author 5 (DLM) conducted all laboratory work involving sample preparation, amplification and typing of human papillomaviruses at CDC. Author 6 (YPC) conducted the laboratory work at Clinical Microsensors. Author 7 (GFB) supported the memorandum of understanding between Clinical Microsensors and CDC and edited the manuscript. Author 8 (WCR) contributed to the conception and design of this study, assisted in drafting the manuscript and supported the memorandum of understanding between Clinical Microsensors and CDC.